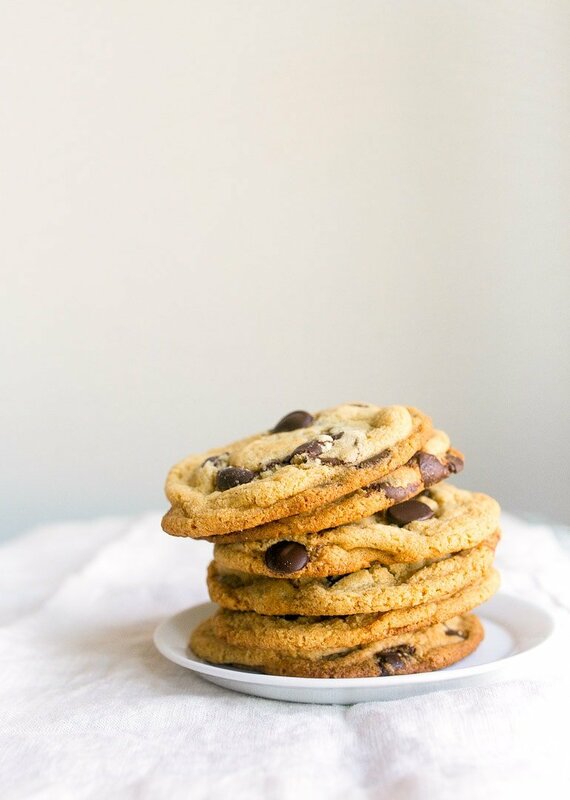 Malted Chocolate Chip Cookies recipe. I love taking recipe requests. Maybe it’s the people-pleaser in me, but I love posing a question on Instagram about what kind of small-batch recipes you guys want to see. While you’re probably still recovering from Christmas, I am already thinking about Valentine’s Day. I took a quick poll on instagram to see if any of you were in the mood for love and chocolate yet, and I’m happy to report I received a resounding YES. Someone piped up and requested ‘any dessert with malt.’ There was something about the open ended-ness of that request that reeled me in. I couldn’t stop thinking about what would taste great with malt powder! We always have malt powder in the pantry. My husband is a chocolate malt enthusiast, and let me stop you right there–the guy does not just love chocolate malts. For 3 months, he drank chocolate malts as his lunch. He ate a healthy breakfast and dinner, eliminated snacks, and somehow, he balanced it all out with zero weight gain. (Like howwwww). Anyway, I grabbed the can of malted milk powder from the pantry, and decided that a malted chocolate chip cookies recipe was ready to happen. Malted milk powder is the same flavor in Whoppers, if you aren’t familiar. And it’s actually very easy to find at even the smallest of grocery stores. It’s in the section with chocolate syrup and chocolate milk powders. I promise, look on the lower shelves for it. Or, find it here. I took my recipe for a small batch of chocolate chip cookies, and used a bigger scoop to get 6 generous cookies. 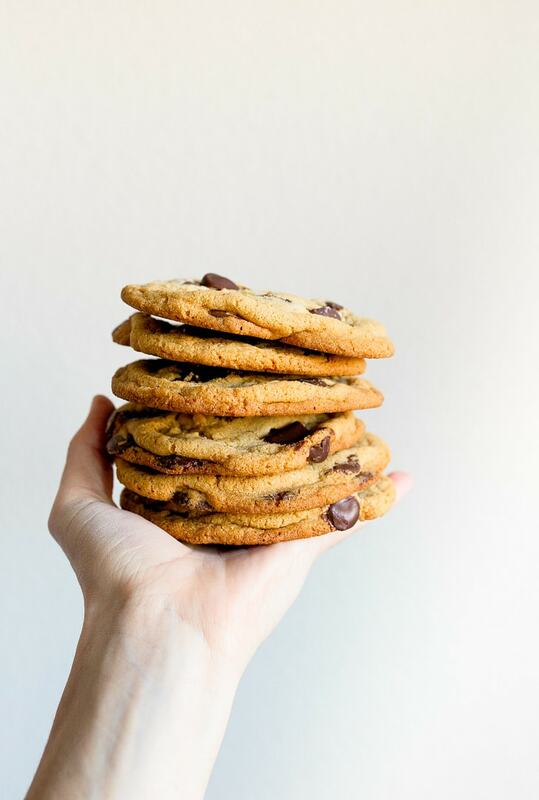 They’re bakery-sized cookies. They spread just enough on the baking sheet that the edges are brown and slightly crispy while the centers are chewy. The malted milk powder flavor is nuanced here; it comes through best in a bite without chocolate chips. 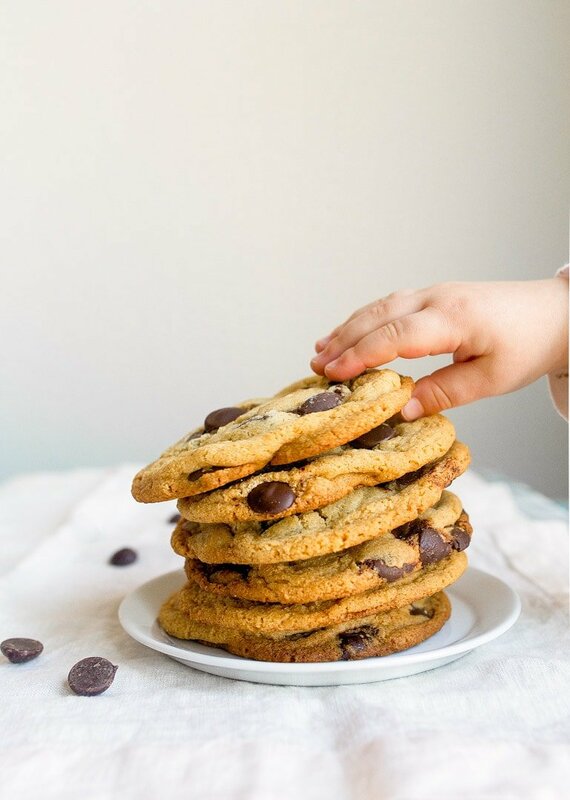 If you’re looking for a standard small batch chocolate chip cookie recipe without malted milk powder, try my other recipe. The way a cookie spreads depends partly on your oven, but mostly on the baking sheet that you use. Use a light-colored metal baking sheet with a sturdy bottom for even heat distribution. Plus, always follow the directions in a recipe for the proper way to prepare your baking sheet. This recipe calls for parchment paper. If you don’t use parchment paper, or if you grease the pan instead, or use a silicone mat, the cookies won’t bake the same way. This is true for every cookie recipe ever. (In my experience, silicone mats slow cookie spread). This is the exact pan I use. It’s heavy, but small and sturdy. And, this is my favorite parchment paper. 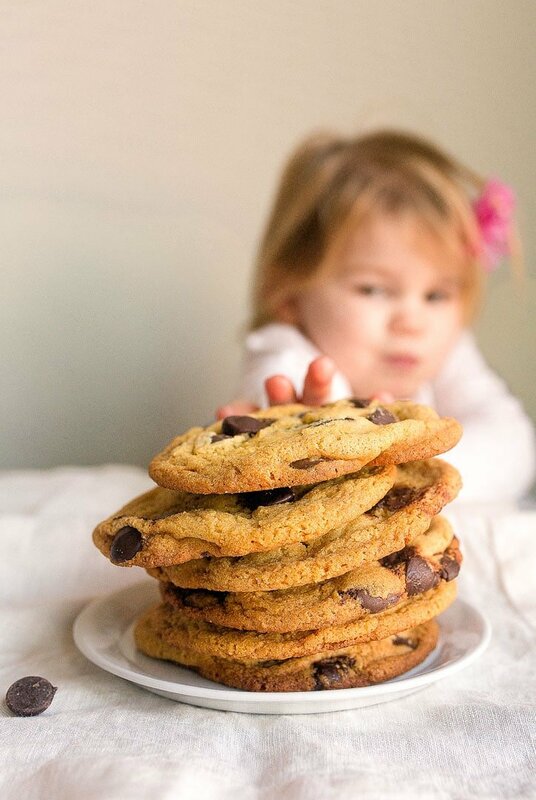 This malted chocolate chip cookies recipe uses only an egg yolk. Don’t miss my list of recipes to use up the remaining egg white. (It looks like someone else is going to inherit her dad’s love of malted milk powder). 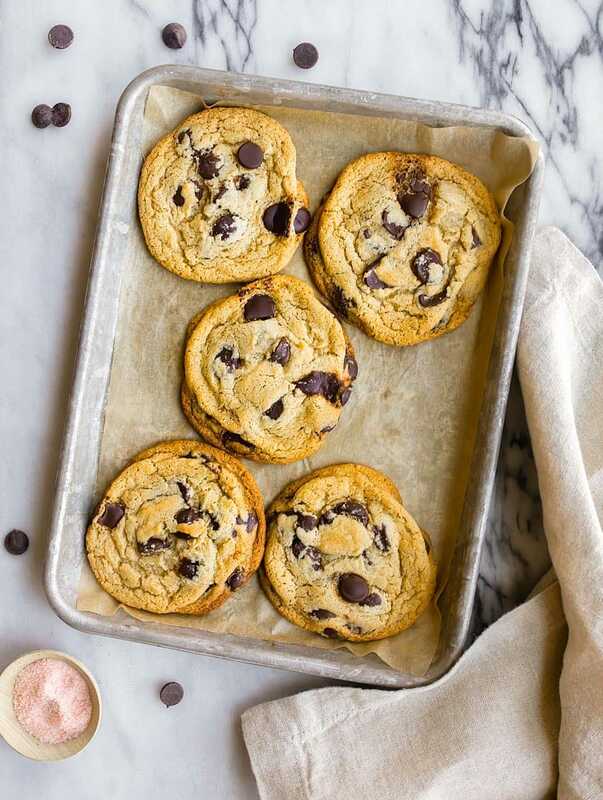 Line a light-colored metal cookie sheet with parchment paper. Set aside. In a medium bowl, cream the butter with an electric mixer on MEDIUM to break it up slightly, about 20 seconds. Next, add the sugars, and beat until light and fluffy, at least 1 full minute. Add the egg yolk and vanilla extract, and beat just to combine. Next, sprinkle the flour, malted milk, salt, baking soda and baking powder on top. (When you're adding them to the bowl, try to sprinkle them evenly over the top. Beat just until the flour mixture is combined. Use a large cookie scoop to make 6 or 7 large dough balls on your cookie sheet. Do not press or flatten out the dough balls. Bake the dough for 11-13 minutes, or until the edges of the cookies are starting to brown. They will deflate and crackle a bit as they cool. Let cool on the cookie sheet for 1 minute before moving to a cooling rack. Oh my gosh, I love the flavor of malt so much! A long time ago I used to work at a place that offered chocolate malts but we so rarely made them – it was always chocolate shakes. A malted black and white is heaven! Ok, just added “get black and white malted” to my agenda today and I’ll probably be making these cookies this weekend (only because I’ve got to wait to pick up malt powder!). Please explain how to make a malted black and white. I love malt flavor, but a malted chocolate milkshake is too much chocolate for me. This sounds interesting. I want to drink a chocolate malt everyday. And not gain weight. Suuuuper jealous. Can’t wait to try these cookies but more importantly thanks for sharing the baking sheets you use. I need new cookie pans! So I am ordering new Nordic Ware baking sheets stat….Especially the smaller size!! LOVE. 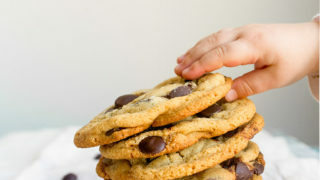 Secondly, baby hands in cookie photos?!!!!!! My ovaries are exploding right now with the cuteness! I hope Camille is feeling better soon! Those little hands! And that sweet little face! Oh my goodness; she’s a cutie. And I love malt powder. I had the best malt in a Boston diner in the fall and I can’t get it out of my head! It was a vanilla malted, and it was the bomb. I never gave malt flavor much thought until then, but now I’m obsessed. I really need to try these cookies. Lord these look amazing! Could you please tell me what brand malt powder you used. I’m making these today! Thanks! I used Carnation :) I got it at Walmart. I tried these twice and they completely melted into a big mess. What the heck did I do wrong? I made your red velvet cookies the other day and they were great. Any guesses on what went wrong? Oh no, Morgan! Melted on the sheet after baking? Did you make any recipe substitutions? The first time I made these the consistency was correct. The second time, they spread out like you described. I accidentally overheated my butter the second time and it was half melted. Did you accidentally melt the butter instead of softening it? It makes a big difference in consistency. Hope this helps with future endeavors. My batter was super dry and crumbly. Added a couple drops of milk, will let you know! Hmmm…are you adding ingredients by weight? I made these and they turned out gr8. If I wanted to double this recipe could I use the whole egg then? No, double it exactly as written.